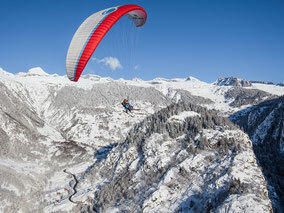 Airvolution offers Paragliding and Hang Gliding Tandemflights in different flying areas around Brig. 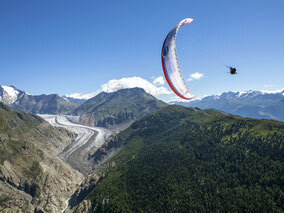 Everyone from 8 years and more can enjoy Paragliding or Hang Gliding without any prior knowledge. Our experienced team of tandempilots will show you round in the Swiss Mountains and make sure, it will be a lifetime experience. If you wish, we take pictures and videos durig the flight and give you a copy on a USB-Drive just after landing. Maybe you flew already and you're courious to experience something more challenging? Under Special offers you will find some different kind of flying. Ask for pick-up at trainstation if you travel with public transports. Payment at the end of your trip can be cash or card, whatever you prefer. In summer we fly from all flying sites around Brig. Calm morning flights from Belalp or thermal flights from Riederalp, it's your choice. In winter we fly in the skiing areas of Belalp and Rosswald. Take-off with skis or snowboard is super easy and the winter air is very calm. That's the real flying feeling! Experience the sensation of flying head forward like an eagle. You'll never get closer beeing a bird.